« JavaOne 2006 daily report: Ehhh daily? 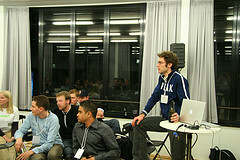 Last weeks reboot8 conference in Copenhagen is over, and it’s time to get back to work. There were some very good talks but it’s the audience that makes reboot a special event. The highlights of my reboot were the talks from Ben Hammersley, Jesse James Garret, Doc Searls and Jeremy Keith (who was asked by Håkan Wium Lie if there was anything he’d like him to add to the HTML A element). For weeks I had been looking forward to presenting my talk on rapid prototyping and do a demo of an application we did in Capgemini. It went fairly well. No technical flaws, I also got a little extra time so there was time for questions. Thanks a lot, I really enjoyed the demo! This should be required reading for any web development team. Good to see clueful work in a big consulting firm…nice presentation. If I had the money I would hire you. After my first attendance last year I knew what to expect somehow and what this will be all about. So this year I did have expectations – the biggest one to be motivated and inspired. This really did happen. The talks from Bill Laio, Ben Hammersley and Jesper Rønn-Jensen were really good and did inspire me again. Prototyping is way important, not only in software engineering, also with organisations. You definitely should understand why, read here [link to justaddwater.dk]. Capgemini lavede en funktionsdygtig prototype af en web-applikation i Ruby on Rails på 20 timer. Normalt når man laver prototyper af web-projekter er det for at få en fælles forståelse af, hvad det er for en dims man har mellem hænderne, hvordan den ser ud og hvad den skal kunne. Med en funktionsdygtig prototype er det meget nemmere at se, hvordan dimsen virker; man kan få lov at bruge den i stedet for at kigge på et billede af den. Og så er alt arbejdet gjort næsten inden man kommer i gang. 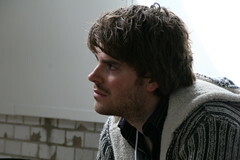 My own impression: I Started out a little too tense, but fund the natural flow afterwards. I was glad for my cuecards, helped me some at the beginning. Thomas took some more photos that are available at Flickr.com. Thursday evening had a geeky meetup about Ruby on Rails. Even though it was after dinner lots of people showed up. 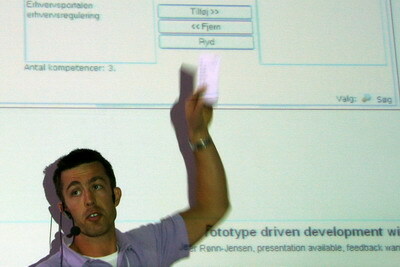 Jarkko Laine had arranged for the meetup and Chris McGrath put up his notes from the meeting. Just as everybody else were partying downstairs, we had a good discussion and exchange of experiences. You probably think: What a geeky way to spend the evening when people are partying downstairs. But when you look closely at the photos, you see that we have beer. All photos available on Flickr.com/photos/jesper. Above all, Reboot was a good opportunity to network. 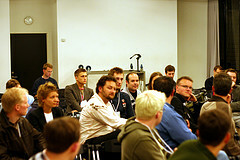 The most important asset of the conference is the participants. 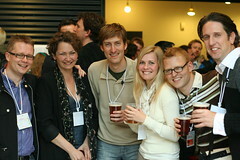 We were really networking at the Rails evening session, and I definetely hope to see some of the Rails-heads again June 29 in Copenhagen. In particular, it was a pleasant to meet Lynn, Line, Jens-Christian, Marston, Reno, Olle, Jan, Geoff, Eric, Marklund, Pelle (and wife), Jakob, Tobias, Michael, Trine-Maria and husband, Maja, Thomas, Pollas, Keith, Jeremy, Jesse, Dalager, Jarkko, Björn, Casper, Claus, Trine, John, Michael, Lars and everybody else I got a chance to talk to. This entry was posted by Jesper Rønn-Jensen	on Tuesday, June 6th, 2006 at 15:27 (GMT-1)	and is filed under Events/seminars, justaddwater.dk, Speaking. You can follow any responses to this entry through the RSS 2.0 feed. Both comments and pings are currently closed. And we will indeed meet again! Awesome roundup, Jesper. Thanks for posting Flickr images. Now we can all hi-five in the digital space, as well; I lost the opportunity to palm my business card to most of the great people I meet. It’ll be a great meetup. I’ll endeavour to call out to the Skåne Sjælland Ruby User Group, in case any Skåne Railsers feel like crossing the water for some geekery.